I started writing a series about Nanjing Road in 2017 after I took interest in the route from a 1929 map of Shanghai that highlighted the market value of different zones in the city. A blue-toned, T-shaped zone of Nanjing Road all the way to the Bund was the city’s most expensive area that year. Nanjing Road was constructed in 1851 as “Park Lane” — from the Bund to the racecourse on today’s Henan Road. It was widely called “Da Malu” in Chinese, which means “Great Horse Road.” The great horse road was extended to Zhejiang Road in 1854 and stretched further to Xizang Road in 1862 as the racecourse was relocated twice — the last one in today’s People’s Square. English missionary Walter Henry Medhurst suggested that “the settlement road names should be made intelligible to the tens of thousands of natives who had crowded into the area for safety from the Taiping Rebellion (1850-64).” Thereafter, Park Lane was renamed Nanjing Road after the ancient Chinese capital city. According to the book “The 140th Anniversary of Nanjing Road West (1862 to 2002),” Shanghai Race Club constructed a 2-mile-long road from today’s Xizang Road M. to Jing’an Temple in 1862. They named the extended road Bubbling Well Road after the renowned bubbling well fronting the temple, which had been filled up and buried underneath. 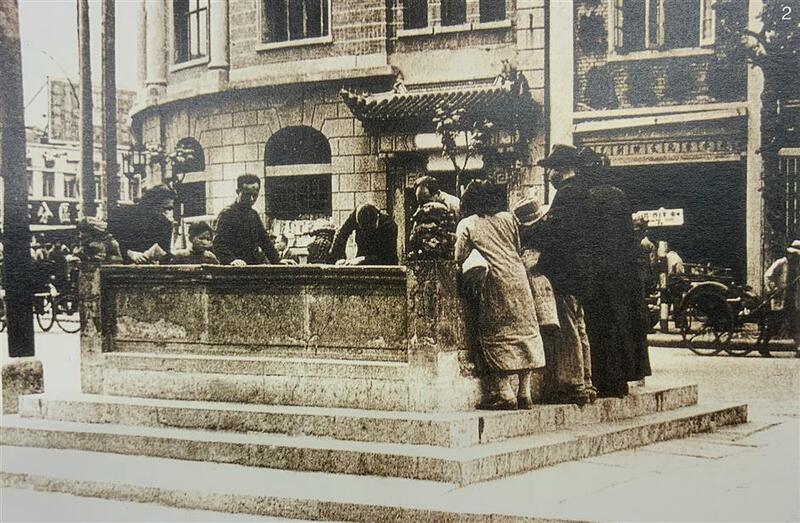 Bubbling Well in front of Jing’an Temple in the 1940s. Then muddy road was paved with stones in 1890, planted with plane trees in 1891 and finally included in the international settlement in 1899. In 1921, the road was further expanded to today’s Yan’an Road W.
Early last century the eastern part of Nanjing Road was upgraded to a world-class shopping street after Chinese merchants erected four modern department stores — concrete structures with modern equipment and high towers — along the street. The western part also flourished with stylish shops, famous theaters and gorgeous garden villas built by foreign and Chinese tycoons. After exploring the bow-shaped Bund, I have followed “the arrow of Shanghai” and walked westward along Nanjing Road. 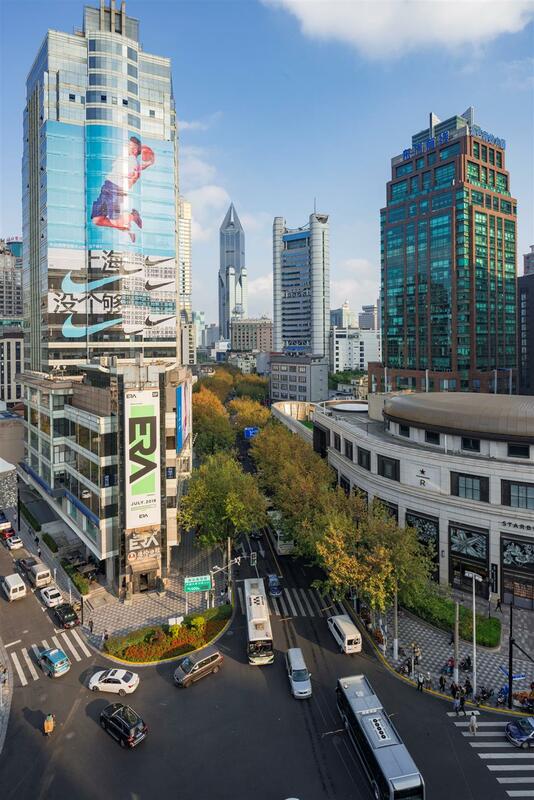 The first part of the journey focusing on the former Park Lane, today’s Nanjing Road E. (from the to Road) ends at The Sun Building, the youngest and most modern among the four big Chinese department stores on Nanjing Road. Upon the much-exp four architectural gems around the square this October that happened to mark the 100th year of his arrival in Shanghai. four architectural gems around the square this October that happened to mark the 100th year of his arrival in Shanghai. Now it’s time to walk further westward from the People’s Square to the ’an Temple along Nanjing Road W. Compared with Nanjing Road E., filled with shops using loud speakers to sell jade brocades and tourists speaking different languages and dialects, Nanjing Road W. seems to be more stylish and relaxing. ’an Temple along Nanjing Road W. Compared with Nanjing Road E., filled with shops using loud speakers to sell jade brocades and tourists speaking different languages and dialects, Nanjing Road W. seems to be more stylish and relaxing. With the help of ’an District government and its four sub-district governments — Nanjing Road W., Road No. 2, Road and ’an Temple sub-districts along the former Bubbling Well Road, I plan to explore an amazing variety of historical buildings, ranging from clubs, hospitals, theaters, apartments, garden villas to the ancient temple and even the former cemetery park.’an District government and its four sub-district governments — Nanjing Road W., Road No. 2, Road and ’an Temple sub-districts along the former Bubbling Well Road, I plan to explore an amazing variety of historical buildings, ranging from clubs, hospitals, theaters, apartments, garden villas to the ancient temple and even the former cemetery park. 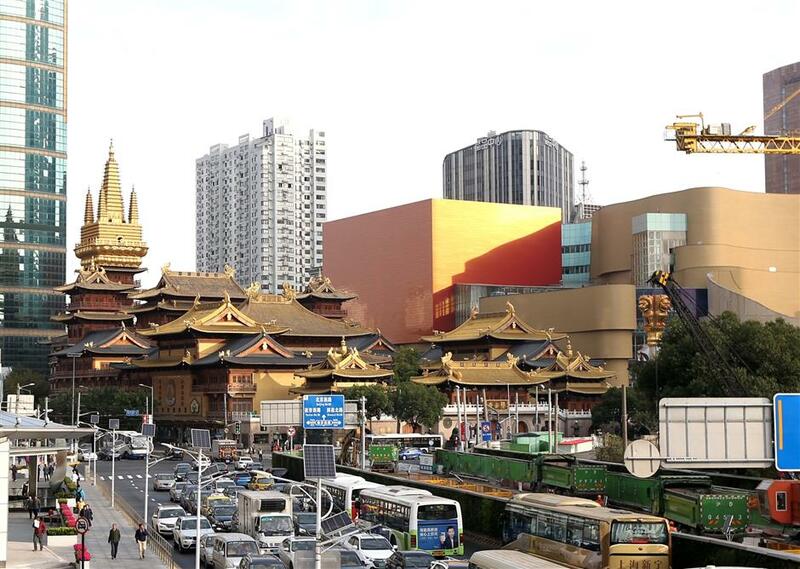 Nestled along Nanjing Road W. is Jing’an Temple, which literally means “Temple of Peace and Tranquility.” The temple has a history of more than 800 years. During recent research, I’m more than happy to learn that some of the newest technologies and devices, such as drones and architectural monitors, have been used to prevent the region’s historical buildings from been destroyed. The local government has learned a lesson from last year’s illegal demolition of 888 Julu Road, a garden villa designed by Laszlo Hudec nearly 100 years ago. These sub-district governments have also organized volunteer teams comprising experts and local heritage aficionados to monitor the conditions of architectural gems. When researching for the series, I was strongly moved by life stories of two expatriates who had left relics and legacies along Nanjing Road W.
One was British millionaire Henry Lester, who made a fortune from old Shanghai’s real estate but donated almost all his assets to Chinese education. A medical institution built with his money still stands a few minutes’ walk from Nanjing Road W. The Lester Foundation sponsors Chinese scholars studying in the UK to this day. The other was a German doctor named Erich Paulun. The former German navy doctor traveled thousands of miles to Shanghai and built a charitable hospital to treat poor Chinese patients for free, which later evolved to be today’s Changzheng Hospital and Tongji University. Though the old hospital buildings along Nanjing Road W. have been demolished, Paulun’s legacy has a lingering influence in Shanghai, China and Germany. In March next year, it will be 110 years since he died. Both Lester and Paulun, who must have worked and walked along the Bubbling Well Road, were both buried in the Bubbling Well Road Cemetery, today’s Jing’an Park. Their spirits and stories, as well as that of the stylish Nanjing Road W. are worth telling and remembering. So let’s continue to follow the arrow of Shanghai. Covered in lush tree canopies, Nanjing Road W. is the main artery of excitement in the flourishing downtown area of Shanghai.